Places like Reading are crying out for fresh casual dining hot spots, with simple but delicious menus. So when a cool new restaurant pops up, I get very excited. “Cool” is usually what happens in London, not in Reading. Welcome to Franco Manca. Where no bookings are taken so just turn up when’s good for you; it’s first come, first served. This place is gonna steal a pizza your heart…gotta love a ‘cheesy’ pun! Avoiding the initial opening week, as I tend to find this is when the teething problems happen, plus as Franco Marco offered lots of free pizzas when opening we knew it would be rammed. I’ve made up for this since though…we’ve eaten there three times in the last two weeks! You can easily get a pizza and a drink for just over £10, it’s very relaxed, no nonsense, the menu is simple and predominantly uses local and available produce only. Everyone loves pizza right? The soft chewy crust (cornicione), the little speckles of blast baked burned sourdough that sizzles with flavour, the gooey cheese and fresh tomato sauce…life changing. With only 6 pizzas to choose from, all freshly made to order, adaptable and with ‘special’ add-on ingredients there is something on the menu that everyone will like. Vegetarian? No problem. Have an allergy? Also…no problem! Fresh, aromatic, creamy, truly spectacular. 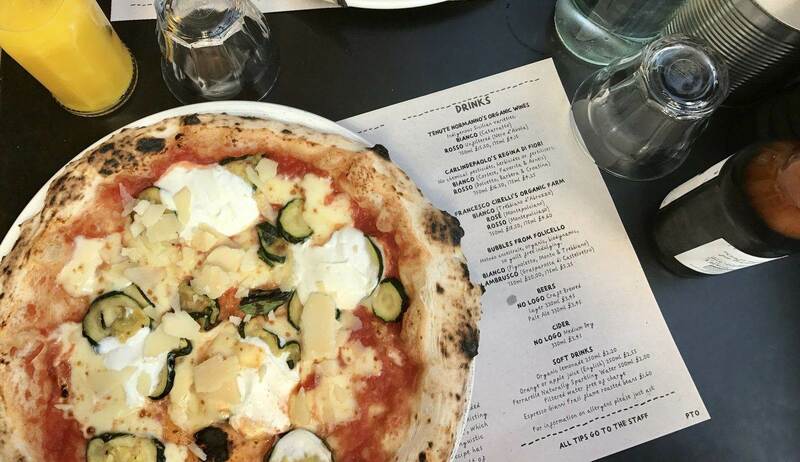 Pizza number 3 – Courgettes, basil, mozzarella, buffalo ricotta, Franco’s grana… finished with a refreshing sprinkling of mint leaves. I’m not usually so easily impressed with a pizza but as soon as I’d had my first bite I knew we’d be back. The staff are all genuinely helpful, the service friendly and because the pizzas are baked so quick they fly over to the table within a few minutes. Truly the greatest fast food on earth. The fresh lemonade is delicious but on a hot sunny day nothing beats an ice-cold lager. With just a little bit more energy left we headed over to our favourite speciality coffee shop, C.U.P. "Gluten Free Cake Recipe & Baking Tips"
Oh I love a good pizza and this one looks delicious! I have been gluten free for two years now and I miss pizza so much, GF versions aren’t quite the same! I am officially starving now, their pizzas looks so so so good. You’re right, Reading is crying out for some cooler places to hang out and enjoy a meal. The decor in this place looks very chilled and totally lends itself to the laidback vibe you describe. Plus anywhere that serves good craft beer is fine by me! Glad you agree 🙂 I love that it’s possible to go somewhere so chilled and quick at serving your food but not feel rushed or pressured to finish either. We’re not too far from Reading, so if we’re around I’ll make sure to pop in as all of us are big pizza fans. Isn’t it just! I’m veggie too and it’s nice to have more than just once choice! I love pizza, and we actually have two Franco Mancas down here in Brighton, but I am yet to go!! I really need to fix this and get there asap. These pizzas look great.